A quick tour through my photo collection will quickly reveal that I have a thing for towers. These buildings used to appear every several miles along the main lines or at every at-grade crossing of two rail lines. Today, there are very few towers left, and even fewer still doing their intended job. In this post we'll look at few towers, some still standing and others not. We start in Marysville, Penn., and Banks Tower, located along the Susquehanna River. 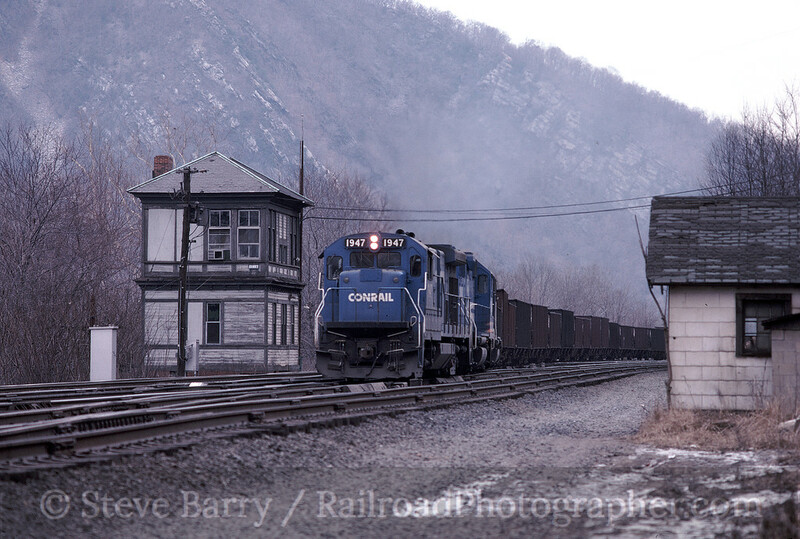 Conrail B23-7 No. 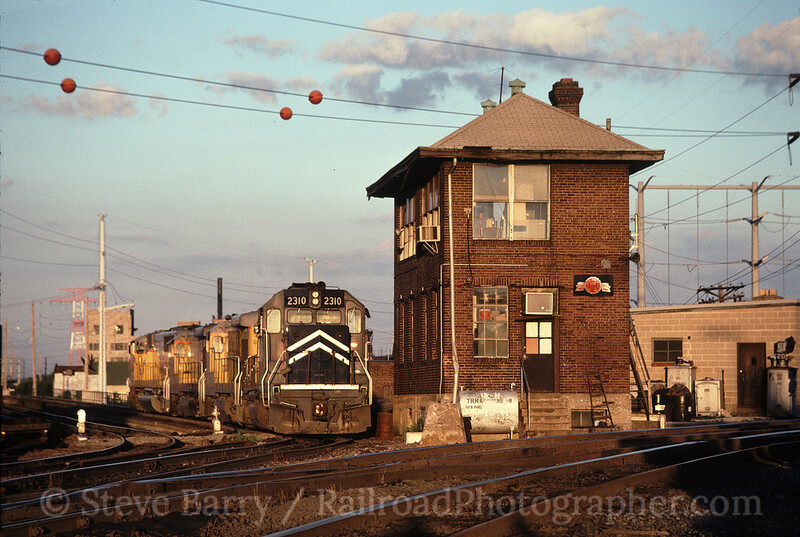 1947 was leading a westbound train past the tower in the winter of 1980 (above). Banks has since been torn down. 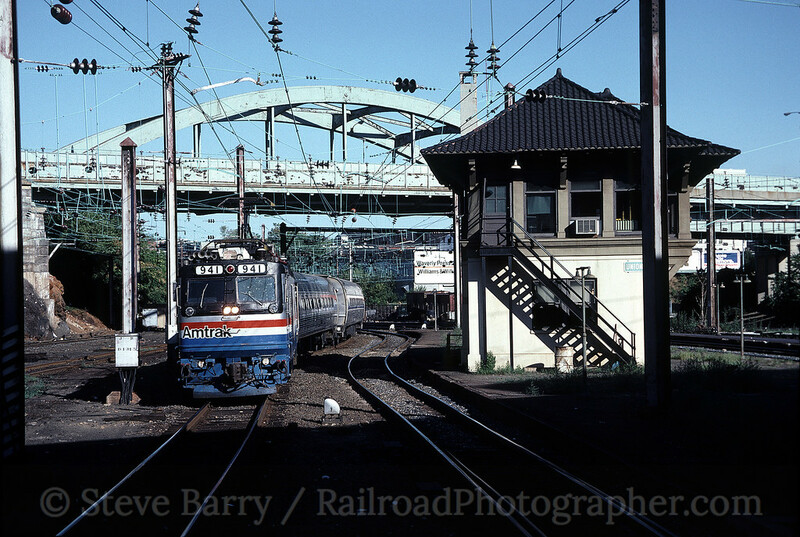 The Northeast Corridor (former Pennsylvania Railroad, now Amtrak) had a lot of towers between New York and Washington, and many of them survive (although only a very small handful are still manned). There were two towers near Pennsylvania Station in Baltimore, one at either end. B&P Tower was one, and Union Tower was the other. Both towers were removed when the tracks around the station were realigned. Below we see Amtrak AEM7 No. 941 passing Union Tower. Amtrak; Union Tower, Baltimore, Md. Okay, how about a tower that's still there. Let's stick with the Northeast Corridor and check out North Philadelphia Tower, adjacent to the station of the same name. This stretch of the corridor sees frequent SEPTA service, and a branch to Chestnut Hill diverges here. 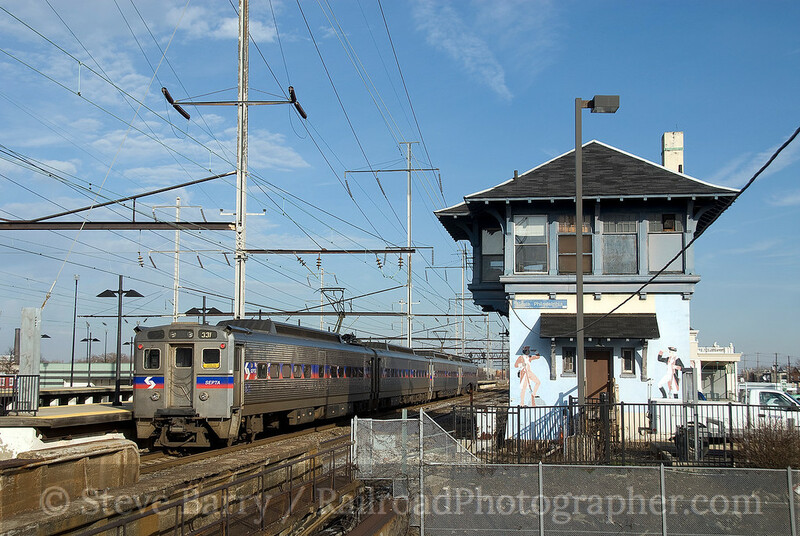 We see a SEPTA train roll past the tower, which is now used as a maintenance base, on December 14, 2008. Moving west, we find another tower still used as a maintenance base. 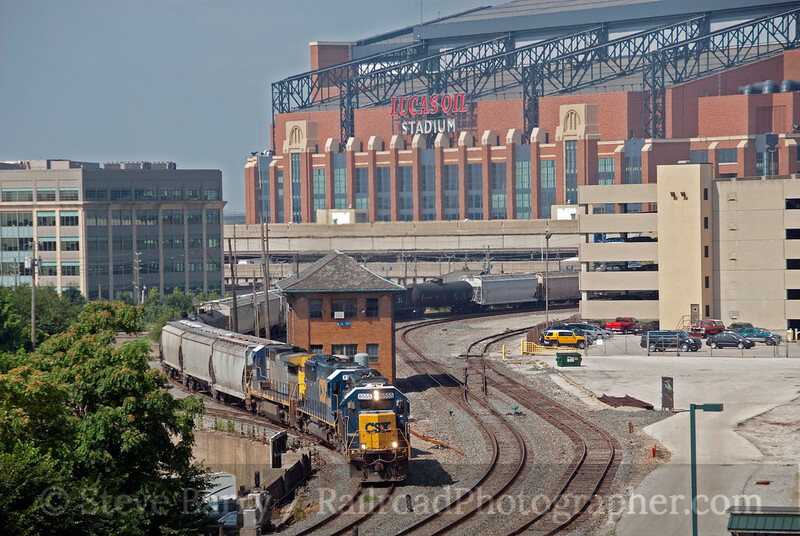 In the shadow of the House That Peyton Built, we find a CSX train passing IU Tower near Lucas Oil Stadium in Indianapolis on July 19, 2010. Peyton may have left town, but the tower is still there. The view is from a parking garage that gets really hot in July. Our next tower is another one that is no longer there. Gratiot Tower was located adjacent to the Gateway Arch and served the Terminal Railroad Association of St. Louis. With several Class I railroads entering the city from all directions, the Terminal Railroad Association provided access between yards and helped expedite traffic through the city. We're in June 1990 for this scene -- Union Pacific had just recently swallowed the Missouri Pacific, and we see MoPac GP38-2 No. 2310 lead a transfer of UP power past the tower. We'll finish up our tower tour on the left coast. We find another tower that still exists, but is no longer manned. 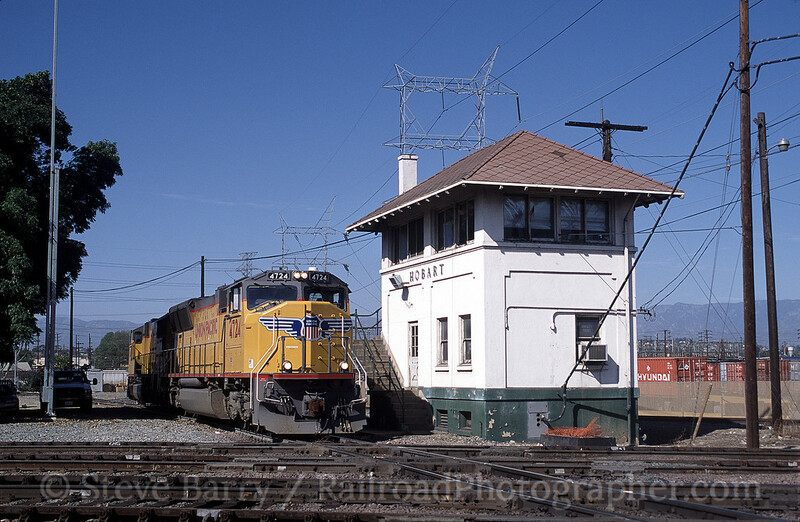 We're in Hobart, Calif., not far from the Ports of Los Angeles and Long Beach, where Union Pacific SD70M leads a light engine move past Hobart Tower in March 2002. The UP power is about the clatter over the diamonds crossing several tracks of BNSF Railway. We'll end this tower tour here, but undoubtedly there will be more, as I really like towers!